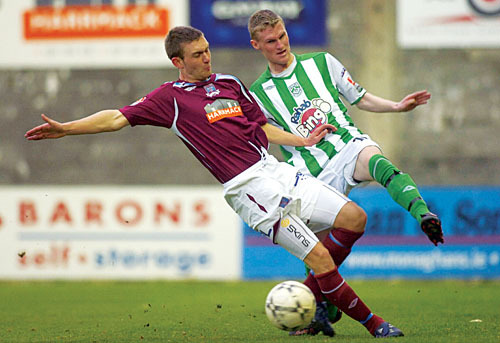 Jay O’Shea could be a key figure for Galway United against Bray Wanderers. As the weeks roll by the margin for error diminishes, ensuring Galway United's season has entered a truly revealing phase. Now is the time to deliver. Positive results need to be accumulated fast and frequently, and tomorrow’s clash with Bray Wanderers at the Carlisle Grounds provides an ideal opportunity. Though Bray started 2008 so efficiently they have suffered a string of disappointing results recently. Tuesday’s defeat to title chasing Bohemians was the latest augmentation to the Wanderers’ woes, as in their last eight top flight matches Bray have lost on six occasions. Considering their previous four yielded a flawless return Bray's decline is curious and Galway will be keen to exploit their diminishing confidence. In the middle of this testing period Galway administered a surprisingly emphatic beating to Bray in the League Cup too. It was a rare three goal success for Galway, who bossed that contest from start to finish. Even though that success only occurred just over a fortnight ago the Galway starting XI has altered radically. Regillio Nooitmeer, Gary Deegan, Derek O'Brien, and Mark Leech are no longer with United. On the night Bray were battered all were heavily involved so it would be misguided to expect a similarly facile triumph. For last Friday's Connacht derby with Sligo Rovers the Galway bench was liberally stocked with youngsters, meaning the capture of Alan Murphy offers acumen and experience. In the Eircom League guile is valuable and Murphy's third stint with United commenced in a welter of excitement. Even before lashing home a venomous free kick Murphy had provided glimpses of genuine footballing ability in the centre of the park. Such subtlety will be required in the seaside town as Bray can play when the mood strikes. Alan Cawley is a tidy midfielder armed with a decent passing range so United will need to be eager and enthusiastic in the centre of the park. Deegan repeatedly thwarted Cawley when the teams last collided, but how will a remodelled Galway outfit cope? Denying Cawley time and space is critical, while on the flanks Jay O'Shea and John Russell will need to assist Murphy and Ollie Fenn. Russell will tuck in and attempt to probe by threading passes down the channels for Derek Glynn. O'Shea offers a threat and, having spent a few years with Bray, the locals will be aware of his skill. When Galway triumphed over Bray in the League Cup O'Shea caused plenty of damage so the Wicklow side have been warned. Still the homesters will also be concentrating on a problem that has vexed them for vast chunks of 2008 as hitting sufficient goals is an issue that has afflicted Bray since March. In their six game unbeaten run during April and the outset of May it was the pacy Kavanagh who provided four crucial strikes out of eight. Still in Bray's 12 other ties they have managed to net a meagre four times. That is a worrying statistic for Eddie Gormley. It is not as if Bray aren’t without decent attackers at this level. Ger Rowe and Kavanagh are capable footballers, and their colleagues will be straining every sinew to create opportunities. Alan Gough's involvement with Bray and Jeff Kenna’s possible competitive playing debut provide other sub plots to an evening thick with significance for Galway, who need to skip back west armed with some sort of dividend. Having endured several harsh hidings Bray will want to avoid being dragged back into the relegation mire so a lively tussle is anticipated. Ultimately this is an akward hurdle for United, but if survival is the mission it must be cleared.